Sometimes it feels like the internet is 90 percent inspirational quotes. Albert Einstein, Gandhi, and Walt Disney are all popular sources for bite-sized nuggets of inspiration. But sometimes the quotes attributed to these people are just wrong. Like these quotes from Disney — a man who didn't actually say, "If you can dream it, you can do it." 1. If you can dream it, you can do it. Even the Disney corporation now attributes this quote to Walt Disney. But he didn't say it. Disney archivist Dave Smith explains that the phrase was actually coined by a Disney employee for the Epcot ride Horizons in the 1980s. "I am very familiar with that line because I wrote it!" Tom Fitzgerald told Disney archivist Dave Smith a few years back. "It was written specifically for the Horizons attraction at Epcot and used in numerous ways, from dialogue in the ride to graphics. I find it amusing that the Science of Imagineering DVD series attributes it to Walt Disney, but I guess I should be flattered." The phrase is actually quite similar to other phrases that not only predate the 1980s, but Disney's heyday as well. Depression-era self-help author Napoleon Hill was said to have come up with the phrase, "Whatever the mind of man can conceive and believe, it can achieve." Pretty close if you ask me. 2. Laughter is timeless, imagination has no age, and dreams are forever. No, Walt Disney never said this. It's generically upbeat and meaningless, so I guess it could sound good coming from anyone who people to turn to for inspiration. But amusingly, this quote is sometimes attributed to Tinker Bell. For what it's worth, in the original animated film Tinker Bell can only be heard in chime noises. 3. The more you are in a state of gratitude, the more you will attract things to be grateful for. It's unclear who first said this, but it most certainly wasn't Walt Disney. But that doesn't stop places like Thought Catalog from passing it off (among with plenty of other fakes) as a real quote from Walt himself. It definitely sounds like it's from The Secret more than anything Disney ever said. 4. The more you like yourself, the less you are like anyone else, which makes you unique. At first glance, it's a an uplifting quote about self-esteem and believing in yourself. And then you read it a second time. Is Disney saying that everyone hates themselves and liking yourself makes you unique and special? No, because he never actually said this. The problem with the quote is that people are dropping a small but crucial word. The real quote: "The more you are like yourself, the less you are like anyone else, which makes you unique." That completely changes the meaning of the quote from something about self-esteem and liking yourself to something about staying true to who you are. The earliest place I could find this quote in print was a 1977 magazine that quotes motivational speaker Mike Vance, who's quoting a conversation he had with Walt Disney. Vance once asked Disney how a person can keep creativity alive. Disney answered: "The more you are like yourself, the less you are like anyone else which makes you unique. The problem with most people is that they spend their lives trying to emulate others and so we have lots of copies but few originals." Now, it's entirely possible that Disney never said this either. It was, after all, more than a decade after his death. But at least it has a better chance of being accurate than the self-esteem version of the quote that pops up online sometime around 2010. 5. You can't just let nature run wild. 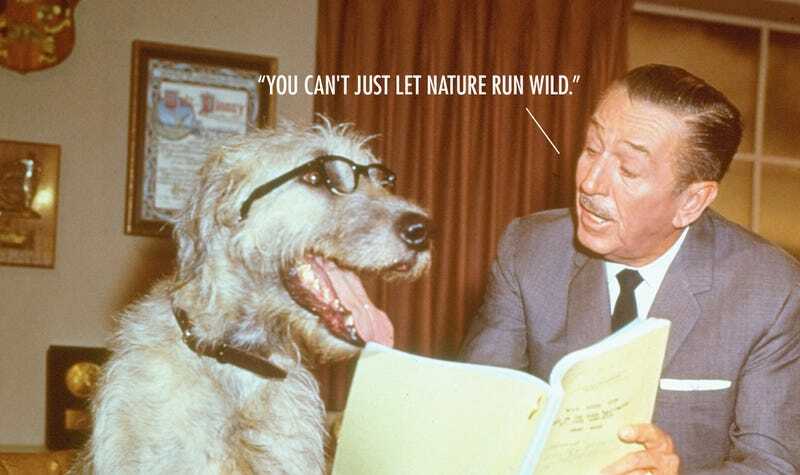 Walt Disney never said this bizarrely humorous quote about not letting nature run wild. So who said it? It was a joke from Walter J. Hickel, the Interior Secretary for President Richard Nixon. It's hard to tell how or why this particular quote became attributed to Walt Disney. Perhaps it's because the Disney theme parks epitomize absolute control over one's environment. Or maybe it was just someone having a chucklegoof. 6. Leadership shows judgment, wisdom, personal appeal and proven competence. It might sound like a great quote to inspire leadership amongst business folk, but it's not from Walt Disney. People have picked up the quote and run with it. But despite what the internet may lead you to believe, Walt never said it. 7. When you believe in a thing, believe in it all the way, implicitly and unquestionable. Okay, now this quote bothers me not only because it's unclear if Disney ever actually said it. The quote, as it's commonly written today, just doesn't make any sense grammatically. You'll frequently see this quote on Pinterest boards and Tumblr. But it doesn't make sense. The real quote? "When you believe in a thing, believe in it all the way, implicitly and unquestionably." The whole thing is still suspect in my book since I haven't found a solid source for the original quote. But I suppose we can start by fixing the grammar. 8. The very things that hold you down are going to lift you up. I suppose it's an inspiring (if admittedly nonsensical) quote. But it's not from Walt Disney. Again, some places like Thought Catalog are a bit confused with their sourcing. Who actually said it? Timothy Mouse from Dumbo. I guess Walt was right when he said that it all started with a mouse.